How Long Should You Cook Meatloaf? There's a lot that goes into making the perfect meatloaf, and cooking time is just one factor. But it seems to be the one that trips up newbie chefs the most. Here we give you the meatloaf lowdown, so you can not only cook meatloaf just right but do everything it takes to get the taste, texture and filling right as well. Ground chuck is the grade of choice for the most flavor, and it's the cheapest option as well. The higher the grade of ground meat, the less fat and shrinkage will result. But keep in mind that less fat means less flavor, and lower-fat meats tend to have less moisture after cooking. Topping the loaf with bacon strips or salt pork adds moisture, flavor, and tenderness. Those watching fat content might want to use turkey bacon or other low-fat alternatives. If you like a mixed-meat loaf (beef, pork, and veal is classic), feel free to experiment with different ratios as long as the total weight of the meat remains the same. Use about 1/2 cup filler per pound of meat. This filler can be bread crumbs, mashed moist bread, oat bran, grated potato, grated carrot, mashed potatoes or wherever your experiments take you. Add a cup of grated cheese to the meatloaf mixture before baking, and another 1/2 cup over the top of the loaf during the last 15 minutes of baking. Add 1/3 cup of vegetable juice, wine, beef broth, or beer to the mixture for added flavor. Soft bread crumbs make a more tender, juicier loaf than dry crumbs. You can briefly soak dry crumbs in a bit of milk before adding. Add tomato sauce to the meat mixture for moisture. 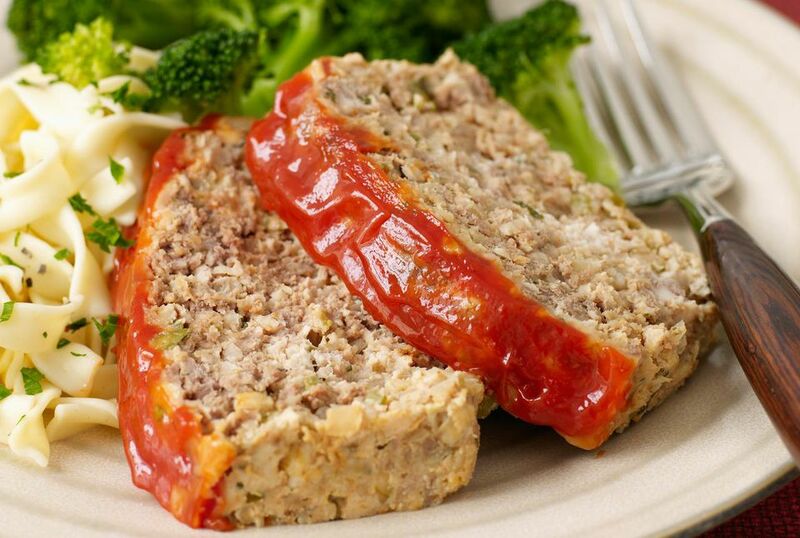 For a firmer texture to your meatloaf, use ground meat that has been run through the grinder at least two or three times. And don't overdo the breadcrumbs. Too much will make the loaf spongy. Do not over-knead the mixture or texture will be lost. Mix just enough to combine the ingredients. In place of bread crumbs, add a mashed wet slice of white bread and a tablespoon of salad oil inside the mixture. The standard meatloaf should be baked in a standard 4-inch by 4-inch by 8-inch loaf pan at 350 degrees for 1 to 1 1/2 hours. To minimize cracking, smooth the top of the loaf by rubbing in a little cold water. For individual servings that bake quickly, mound meat mixture into greased muffin tins, which should be done in about 20 minutes. The internal temperature of the meatloaf should register 170 degrees F for beef or 185 degrees F for pork. To help this happen, let meatloaf stand about 20 minutes or longer after removal from the oven before serving. During this time the meatloaf will cook internally. This also helps it set and makes it easier to slice.